Figure 1. Locations of sampling sites in the lower Clackamas River basin, Oregon, 2000–2005. Figure 2. Distribution of data-collection activities and streamflow and turbidity conditions in the lower Clackamas River at Oregon City, Oregon, 2002–2005. Figure 3. Streamflow and turbidity conditions in the lower Clackamas River at Oregon City, Oregon (USGS continuous water-quality monitor and streamflow-gaging station 14211010), during the May and September 2005 storm event samplings. Figure 4. Daily and hourly precipitation at the Holgate Road rain gage and distribution of storm samples collected in the lower Clackamas River basin, Oregon, 2000–2005. Figure 5. Patterns in streamflow and water yield, pesticide numbers and total concentrations, and instantaneous pesticide load and yields during two storm event samplings in the lower Clackamas River basin, Oregon, May and September 2005. Figure 6. Percentage of total pesticide concentration from the common herbicide products RoundUP™ (glyphosate and its degradate AMPA) and Crossbow™ (2,4–D and triclopyr), fungicides, and insecticides for storm samples collected from tributaries, May and September 2005. Figure 7. Number of pesticide compounds detected in samples collected from the lower Clackamas River basin tributaries and in source and finished drinking water from the study water-treatment plant on the lower Clackamas River, Oregon, 2000–2005. Figure 8. Maximum concentrations of herbicides, insecticides, and fungicides detected in samples collected from the lower Clackamas River basin, Oregon, 2000–2005. Figure 9. Number, total concentration, and total instantaneous load of pesticides for samples collected during the EUSE urbanization study from three streams in the Deep Creek basin, Oregon, 2003–2004. Figure 10. Total number of pesticides detected and total pesticide concentrations for storm and nonstorm samples of source water collected from the study water-treatment plant on the lower Clackamas River, Oregon, 2002–2005. Figure 11. Total pesticide concentrations in source and finished drinking water samples collected from the study water-treatment plant on the lower Clackamas River, Oregon, 2002–2005. Figure 12. Number of pesticides detected and total pesticide concentrations in source and finished drinking water samples collected from the study water-treatment plant on the lower Clackamas River, Oregon, 2004–2005. Figure 13. Highest Pesticide Toxicity Index values for benthic invertebrates and fish for samples collected from the lower Clackamas River basin tributaries, Oregon, 2000–2005. Figure 14. Maximum benchmark quotients for pesticide concentrations in finished drinking-water samples from the study water-treatment plant on the lower Clackamas River, Oregon, 2004–2005. Table 1. Sites sampled for pesticides in the lower Clackamas River basin, Oregon, 2000–2005. Table 2. 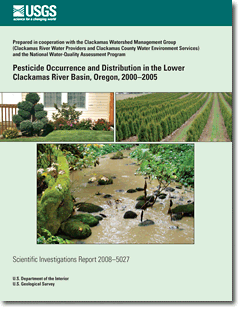 Pesticide data-collection activities in the lower Clackamas River basin, Oregon, 2000–2005. Table 3. Pesticide compounds detected in the lower Clackamas River basin, Oregon, 2000–2005. Table 4. Pesticide concentrations in source and finished drinking water from the study water-treatment plant on the lower Clackamas River, Oregon, 2004–2005. Table 5. Potential effect of powdered activated carbon on concentrations of pesticides and degradates in finished water samples collected from the study water-treatment plant on the lower Clackamas River, Oregon, 2004–2005. Table 6. Aquatic-life benchmarks for pesticides and degradates detected in the lower Clackamas River basin, Oregon, 2000–2005. Table 7. Pesticide Toxicity Index values for benthic invertebrates and fish for stormwater samples collected in the lower Clackamas River basin, May and September 2005. Table 8. Maximum benchmark quotients for pesticide concentrations in finished drinking-water samples from the study water-treatment plant on the lower Clackamas River, Oregon, 2004–2005. Table 9. Potential human-health effects of select pesticides detected in the lower Clackamas River basin, Oregon, 2000–2005. Table 10. Potential uses for pesticides detected in the lower Clackamas River basin, Oregon, 2000–2005. Send questions or comments about this report to the author, K.D. Carpenter, (503) 251-3215.